During UVA visiting days, thousands of bedsheets are used by overnight students and guests for, at most, a few nights. But washing all of these sheets can have a significant impact on the environment. A typical load of laundry uses approximately 30 to 40 gallons of water as well as a lot of energy to heat the water. On top of that, many laundry detergents are harmful to the environment, and each laundry cycle releases toxins into the environment that could have a significant impact on climate change. Since sheets are bulky, it also takes a large amount of energy to wash the thousands of sheet sets used by visiting students. Instead of releasing this impact on the environment, UVA instead uses Laundry-Free Linens® for all of its freshman orientations. Beantown Bedding's sheets are completely eco-friendly throughout their lifecycle; made from responsibly-sourced eucalyptus, the sheets are USDA certified as 100 percent biobased, require no laundering, and biodegrade quickly with no toxic residues. The sheets return to nature in as little as two weeks. The composting of UVA's sheets is facilitated by Black Bear Composting, an organics recycling company located in the Blue Ridge Mountains of Virginia. The company helps local businesses, organizations and residents reduce their waste stream by recycling organic materials—like food scraps, yard trimmings, and clean waste wood—into products for healthy soil. After UVA orientation, Black Bear Composting picks up the sheets and composts them right alongside the food scraps from UVA's campus, eventually donating a portion of the rich compost back to UVA for use in its Community Garden. In other words, UVA is implementing full-circle composting for both environmental responsibility and campus beautification. UVA joins a larger movement of colleges, universities and event venues turning to composting in order to reduce the waste produced by large events. 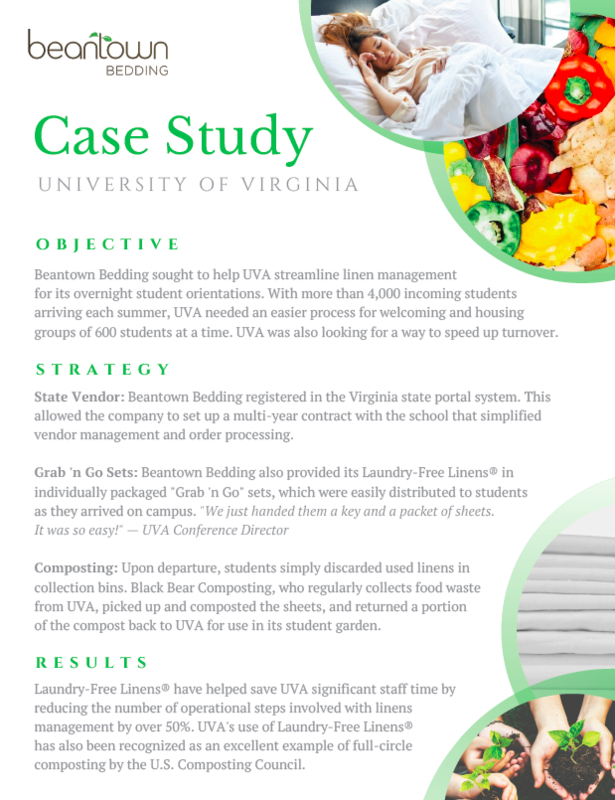 UVA's use of Laundry-Free Linens® has even been recognized by the U.S. Composting Council as an excellent example of full-cycle composting. Interested in learning more about Laundry-Free Linens®?